There are many ways to launch a startup, and none of them are particularly easy. There’s a huge element of risk involved for all concerned. However, as the importance of startups finally becomes apparent to the powers-that-be, the tools and opportunities available to tech entrepreneurs in countries like Ireland is taking some of the fear out of it. This is no doubt a good thing, but perhaps some of these startups are living in an artificial cocoon of funding, incubation, mentoring, games rooms, and lattes in the common area. The fear of losing everything isn’t always as strong a motivating factor as it once was. The good folk behind Application Metrics-as-a-Service provider, MetricFire, have decided to do it the hard way. Dave Concannon has worked with a number of successful startups over the years (including mobile security developers YouGetItBack), while co-founder Charlie Von Metzradt had been working with Demonware in Dublin. “I decided it was time for me to finally step out and do something for myself,” recalls Dave. Charlie, he says, was the obvious choice for a partner, “I’ve worked with him before, I can trust him – I know he’s very, very smart”. The two took what they both had in the bank, enough to last a year, and they’ve bootstrapped their way from idea to market. The idea for Metricfire came from their past experiences as software engineers, such as Charlie’s time at Demonware, where he saw first-hand the need to be able to track huge amounts of metrics coming from systems. “There’s a lot of mission critical stuff,” says Dave, “so it’s absolutely critical that you know when things are slowing down and be able to eliminate all the bottlenecks”. The pair felt that, while many companies offer solutions to one or more of the problems presented by application metrics, none was comprehensive enough to make outsourcing worthwhile. “There are a lot of solutions that do individual parts; you can measure things, you can alert things; but connecting them all together is a real pain. We want to be the one-stop shop for measuring everything inside an application and then letting people know when something’s gone wrong. Basically, it’s a way to measure everything that’s out there,” says Dave. Charlie remains in Dublin, while Dave is out in California. An American presence is important, they felt. Even if they are not quite at the stage where it has begun to make a difference, it projects a message of intent. “It’s not even just to have an American presence, but almost to have a presence in the Bay Area,” says Dave. He recalls an anecdote where an acquaintance could not secure funding from VCs until he moved from San Diego to San Francisco, whereupon the investors began to take him seriously, “It’s that odd perception of having to be at the hub, I suppose, around the Bay Area, which is a little bit strange”. For a two-man operation, the eight-hour time difference between Dave and Charlie might have been an issue, but Dave notes that Charlie, “tends to keep odd hours so he’s more on my time zone”. “It works out pretty well because our days overlap probably 80-85 per cent so we’re online at the same time, which works out very well. We get a lot done; it feels like he’s just down the road,” he says. Metricfire was in a beta program for four months, “Gradually letting more and more people in, getting feedback on what they like, what they’d like changed, how the interface works, how it suits them”, and has just this month launched its first pricing plans. They are hopeful that companies will see the benefit of purchasing this software as a service, rather than devoting programmers’ and engineers’ time and effort towards resolving these issues in-house. “Would you rather have your developers writing code for you, or would you rather have them fixing a thing that lets you know when something else has gone wrong? “The comparison we’d make is; you can take one of your developers, have him spend the day figuring out what the different options are – install one of those – then he has to find out the next part of the chain – install that – connect them all; that’s another couple of days’ work. And then eventually, maybe six months down the line, something goes wrong, and he has to fix it, or maybe he’s left the company or he’s too busy, so someone else has to do it, so you’re looking at all these days accumulated,” explains Dave with all the exasperation of someone who’s been in this situation before, and resolved not to repeat the experience. Metricfire is, explains Dave, “Kind of language agnostic”, and can cater for almost any application out there, big or small. They also plan to offer free projects to open-source developers and students. While they have bootstrapped so far, they are hopeful that the connections of David Smith and Enterprise Ireland will prove, “A pretty good resource for what we’re doing,” and open some doors for Metricfire in Silicon Valley. Angels and VCs constantly harp on about wanting more than just talented people with good ideas; they want to know that their money is in safe hands. Having eschewed all outside help and crafted a viable business across two continents, Dave and Charlie will hope to show investors that Metricfire is as safe a pair of hands as any in these uncertain times. One of the ironies of our high tech age is that developers and designers seem to know very little about the value of software as a product. There are all kinds of encouragements and advice on how to be a lean startup, to utilise Agile for development, to ship early and often and so on. But these are just methods to attaining a given goal in, hopefully, a faster and better way. Admirable as some of this guidance maybe, software applications and software businesses are often created seemingly without very much understanding of the real, inherent value of Intellectual Property (IP). Techies (and most other people it should be said) find that due to the lack of any absolute way of directly applying a useful metric they are reluctant to engage with the intangible. The value of IP, like the value of marketing doesn’t lend itself easily to quantification — the lifeblood of the engineering process. That means it is left to other people such as investors, lawyers, promoters and, of course, the tax authorities, to care about what a piece of software is worth. There all kinds of intangibles but fortunately, software is one of the more tangible intangibles. An intangible is not valued on the cost of the production but on the cost of the future income it will bring. If you want to value software you have to assess the future income stream. A piece of Intellectual Property (IP) is not the same kind of commodity as say, a brick. Like nearly all commodities, bricks only have a value when they are in demand, usually at a time when a wall or a house is going to be built. Otherwise they are either inventory lying around incurring costs or are highly illiquid constituents of a construction. 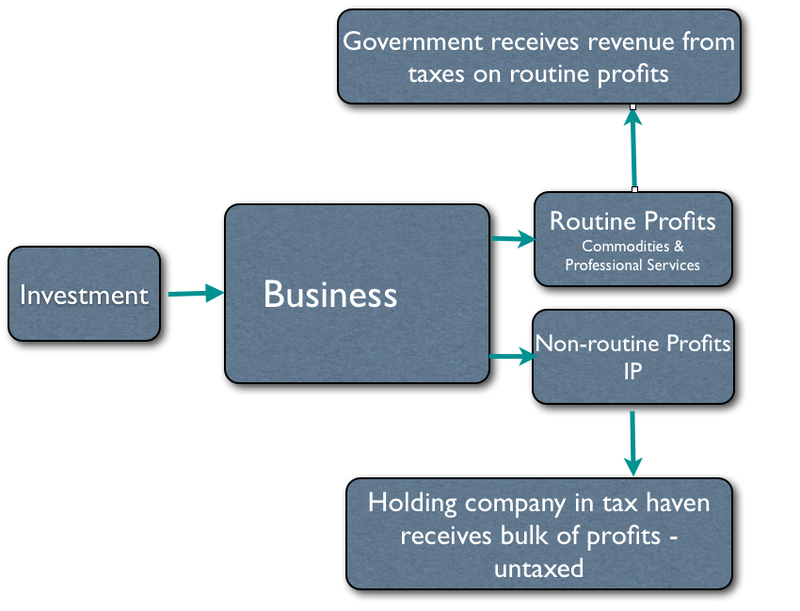 As far as accounting systems go, money made from commodities such as bricks or professional services are classed as routine profits. Due to the unquantifiable nature of IP it is regarded as being non-routine. This is an important distinction because as you will see this is where the real money is. There are also two other important factors concerning IP. It is extremely portable and it is highly recyclable. The same IP can be used again and again. The core IP of most of the major pieces of software that we use, spreadsheets, word processing programmes and the like have changed little over the years. All we have had, for the most part, is the same basic function with new features, different user interfaces and other assorted bells and whistles. The IP value of a given piece of software remains constant from one version to the next and is different in value from the what the customer perceives and will pay for in terms of updates and new features. Also, that core IP can be stored anywhere in the world or even merely said to be stored anywhere, by means of filling in a few registration forms. Gio Wiederhold, Professor Emeritus at Stanford University, was at NUI Galway last summer to receive an Honorary Doctorate. While he was in town he gave a talk entitled “How to Value Software in a Business and Where might the Value Go?” and afterwards spoke to Technology Voice. “Our attitude to software generation has not changed with the times. If software is misvalued, creators don’t get the value from it and the government doesn’t benefit from it in taxes. — This can result in a disincentive for investors to invest and a lack of future job creation. Just to muddy the waters further, companies and corporations can very easily take advantage of the extreme portability of IP. This means that parent corporation can have a holding company in a tax haven somewhere like the Cayman Islands whose only purpose is to hold the registration for the IP. It is then able to receive fees from the licensing and pay no tax. But try as they might, corporations still need people to work for them; developing new products, dealing with customers and so on. Also, large corporations need to keep going 24 hours a day so having to have operating bases in Europe becomes a consequence of doing business. Choosing English speaking Ireland with its low rate of corporate taxation and highly qualified workforce was a no-brainer for many US corporations when it came to establishing an overseas location. So, a parent corporation can have a subsidiary in Ireland. It can then have that Irish subsidiary licence its IP from a holding company set up in the Cayman Islands or tax haven of choice and taxes from the non-routine IP profits are, quite legally, avoided. “Because the IP is overseas, multinational companies and Ireland [unlike the UK and the US] only legislates for taxes on its own territory then these companies are only liable for taxation on their routine profits. “Ireland’s corporate tax rate of 12.5% is only applied to the usual routine profits and not to the profits from the IP which are a cost on the books as they are often a licence fee to a shell company in a more favourable jurisdiction. 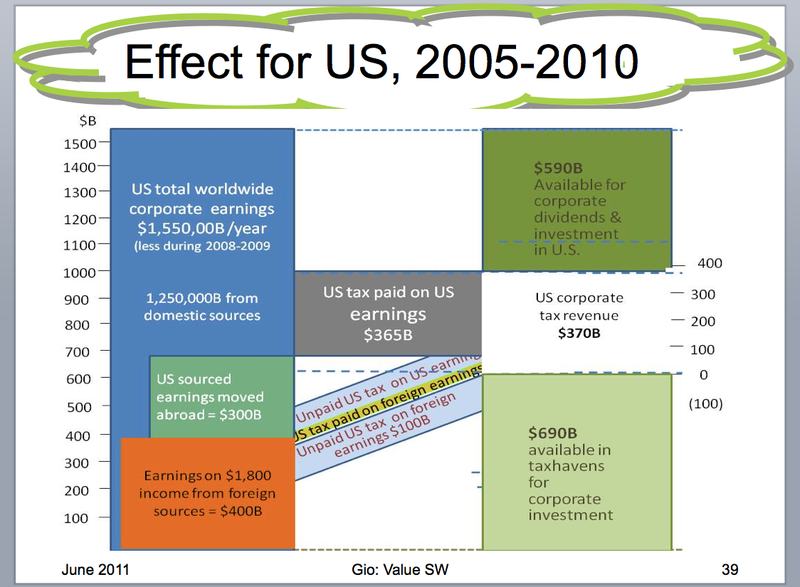 Thanks to Professor Wiederhold for the use of Loss of Revenue to US Government image. More material on this subject is available from the infolab website. Social discovery is an online space that has been emerging over the last couple of years. It is a throwback to some of the original ideas that the first social networks were built around. Friendster was about meeting new people through mutual friendships. Likewise, MySpace was a very social way of discovering new music. In contrast, Facebook, with its multiple levels of privacy settings is very much about keeping in touch with people you already know. Social discovery is, in essence, a network that enables you to meet people. For the moment, with Facebook’s star still in the ascendency, launching a competing social network is a task set aside for the brave and the foolhardy. A smarter way to address the need people have for meeting new people would be to integrate a social discovery application with the Facebook platform. This is what Barry Cassidy has done with his company Speeksy — a social discovery platform that uses Facebook information to create connections through shared interests and mutual friends. Barry says that, “We looked at how people met new people in the real world. What was it that makes a connection between you and someone new that you are meeting? Essentially, mutual friends is a big thing and so is common interests. Speeksy has just one single sign-on process. Information needed to create an account is pulled from Facebook’s Open Graph. A match is then made between you and people who share your interests and are connected to you through mutual friendships. Connections are created based on things that you have already indicated that you liked on Facebook such as movies, TV shows, bands, books and so forth. Barry says, “It is a seamless entry from Facebook into our product where you don’t have to create a profile of fill in a questionnaire or personality test. “We are trying to create a social experience where you can meet new people in a very natural way. We are creating an enjoyable social experience that people will want to go to and engage with regardless of whether they meet new people or not. Meeting new people (providing they are not nut-jobs) is a necessary component for maintaining our health as we move through life. We are social animals who revel in novelty. New social encounters can sometimes challenge some of our fixed, but maybe false, notions. They can provide new sources of stimulation and through shared interests we can feel a sense of belonging that is essential to our tribal natures. Most of social media is human nature taking advantage of the technologies of the World Wide Web to broaden one’s horizon from the village and the local area to the global. Social discovery and applications like Speeksy offer us a new opportunities for fresh engagement based on shared interests. Having common ground to begin with makes it all the easier for new relationships to flourish. Last year we covered the Propeller Accelerator Programme, Propeller Venture Accelerator Fund: Hands on Program for Startups and Early Stage Companies. Similarly, this year, The Propeller 2.0 Venture Accelerator Investor will culminate in a Demo Day which will be hosted by the DCU Ryan Academy for Entrepreneurship and will place this Friday April 27. The Demo Day comes at the end of months of hard work creating, innovating and developing a product and structuring a viable business proposition. The culmination of all this focused effort takes place at an event where the companies get to pitch their projects and ideas to potential investors. The companies are supported by the DCU Ryan Academy team and have the constant availability of guidance and advice of over 60 mentors. We spoke to the Venture Manager at DCU Ryan Academy Propeller Venture Accelerator, Terence Bowden about this year’s programme. For this, the second Propellor programme there were 137 applicants this year, double the previous amount. Terence says that in addition, “The quality of the applicants that have applied to us has jumped significantly compared to last year. Last year the companies involved in the demo-day raised $1.73 million and as a result 28 jobs were created. Terence says this year, like last year, the companies are of a very high quality and he has high expectations for their success. The event is invitation only as Terence reckons, “We’d have everybody lined up outside wanting to get in. Whose going to be at the event? Basically, it is going to be investors. Picturk, a platform for hosting digital photograph competitions. Seoige Technology, a software development company.specialising in virtual games including savvybear.com, a computer game for children under 12. (See Technology Voice artlce Savvy Bears: Secure Online Gaming For Children). Style Cloud, a virtual wardrobe and style-sharing social network. SwiftQueue, provider of self-service appointments for healthcare facilities, anytime, anywhere. VideoElephant, an online B2B video marketplace for buying and selling video content. Zeto Technology Solutions, designers of technology solutions for the refrigeration industry. Kieran Logan founded Cork-based RoleConnect as a result of personal experience. He had been working as an IT contractor for almost 10 years doing software development and systems design. He obtained most of his work through recruitment agencies. However, 2004 he became the CTO of a small company and was in a position where he was required to hire contractors from time to time. This is a process that involves two different negotiations and lacks any kind of transparency. There was a substantial amount of space in the middle where they could both meet. Although from the user point of view RoleConnect may look like an application built on a database it actually uses search engine technology to access profile information. “In 2009 we did a study over the summer months. [The summer was picked so they could see recruitment amongst recent graduates.] Over a three month period we captured every single job advertised in Ireland and analyzed them. In that period of time, approximately 8.5% of the jobs advertised were contract jobs. The rest being permanent. This seismic change or as Kieran puts it, “Strongly emerging trend,” is not about to reverse itself anytime soon. RoleConnect has just two full-time employees, Kieran himself and Catherine Wall formerly of it@cork. Kieran says, “We needed to be true to what we believe in and the rest of the workers are contractors. “From the company side we are concentrating on Ireland and the UK at this point. But our ambition would be to be global and not just nationwide and across the water. On March 23rd this year Sean O’ Sullivan an Irish/American entrepreneur, was asked to give a keynote speech at a technology leaders conference. He gave a talk entitled “Re-inventing Ireland: Making Ireland the Silicon Valley of Europe” which was inspired by his need to address the biggest challenge to the growth of his own business — the lack of properly qualified, engineering talent presently available in Ireland. This is a problem that faces the entire Irish tech sector. Many companies are being held back by the inability to find and hire enough people with the requisite technical skillset. As a result of that speech the Open Ireland initiative was born. Technology Voice spoke with Sean recently to find out why Open Ireland isn’t just another earnest, well-meaning, flag-waving, talking shop. “We have to recognize that Ireland with a population of 4.2 million can’t produce enough engineers to produce the products required by the [7 billion] people on the planet.” Says Sean, “We have to acknowledge that there is a short-term problem with economy here that was caused by an errant banking sector and an errant property development sector. This has nothing to do with the success that we have had in technology. “The first goal is to create Ireland as a vibrant economy where people are coming to rather than leaving. To double the population over the next 20 years and to have people accept that the goal is to have Ireland become more cosmopolitan and for Ireland to become more open to immigration rather than emigration. That would involve enabling over 70,000 work visas to become available for suitably qualified people. Unlike a lot of government initiatives these suggestions require little or no money to make happen. “These are things that can be done without spending any tax-payer dollars yet these are things that will increase the flow of funds to the exchequer and help us to recover our economic vibrancy. There is also an enormous opportunity for Ireland to take the legislative lead in rewriting in some its laws around the issuing of work permits. Silicon Valley has exactly the same problem as the US government is not providing enough visas for IT professionals with highly desired skillsets. But due to this being an election year, taking place at the end of a long and deep recession, it is extremely unlikely that have immigration quotas and restrictions will be eased. Sean is very aware of this opportunity for Ireland, “If Ireland is going to become the first country in the English speaking world to open its borders to high-tech talent then we’ll have huge inward investment by any company that is facing this type of shortage. “I think it would be a huge relief to Silicon Valley if they could come and open new plants and operations in Ireland— if they could get access to the workers in Ireland. “Why don’t we trade on our advantages in our world-leading position in that market to help us get out of trouble? You can pledge your support for this initiative by visiting the Open Ireland site. *A full breakdown of export categories can be downloaded from the CSO website.